100 years ago this month the Benevolent Protective Order of Elks completed a major renovation to the building they had acquired ten years earlier to serve as the home to their Lodge #30. 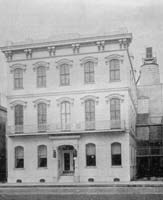 Before the Elks took possession, the property housed one of the elegant brothels that dominated South Basin Street between Canal Street and Tulane Avenue prior to the establishment of Storyville. When the city ordinance restricting prostitution to a defined geographical district was passed in 1897 the "pleasure palaces" then operating outside of the specified limits were forced to relocate. Soon after the BPOE took over the house at 121 South Basin, the street's name was changed to Elk Place. Though replaced by a larger and more modern structure in 1917 (still standing, though now owned by Tulane University), the old Elks' Home had been quite a showplace in its own right. We know something about the appearance of the Elks' Home from a group of photographs, taken by famed Storyville portraitist Ernest J. Bellocq, that were reproduced in the March 1907 issue of the Southern Buck. That journal, published monthly in New Orleans, was the "official organ of the States of Louisiana and Mississippi and endorsed by the Texas Benevolent and Protective Army of Elks." 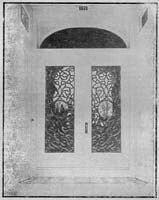 This month's gallery features the fifteen photographs of the Elks' Home that appeared in the Southern Buck. In addition to highlighting lesser-known side of Bellocq's photographic work, the images also provide a glimpse of what constituted popular interior design in New Orleans a century ago.